Summary. Aim: The IGHV mutational status is one of the most important markers for chronic lymphocytic leukemia (CLL) prognostication. Lipoprotein lipase (LPL) gene expression was found to correlate with IGHV status and was suggested as its surrogate marker. Recent data reported that LPL expression might be influenced by pivotal signalling pathways in CLL. This study aimed to assess LPL gene expression in relation to key immunogenetic and molecular markers of CLL, including IGHV mutational status, B-cell receptor (BCR) stereotypy, TP53, NOTCH1, and SF3B1 gene mutations. Materials and Methods: Expression of LPL mRNA was measured in peripheral blood mononuclear cells of 73 CLL patients by real-time quantitative reverse transcription polymerase chain reaction (RT-qPCR). IGHV, NOTCH1, TP53, and SF3B1 gene mutation analysis was performed by PCR amplification and direct sequencing. Results: 44 of 73 (60%) CLL cases were categorized as LPL-positive based on the cut-off value established by ROC (receiver operating characteristic) curve analysis. LPL expression was significantly associated with IGHV mutation status (r = 0.684; p < 0.0001) and tended to correlate with presence of NOTCH1 gene mutations (p = 0.113). BCR stereotyped cases showed higher LPL expression values in comparison to unstereotyped cases in the LPL-positive group of patients (p = 0.041). LPL expression was associated with a shorter overall survival in the entire СLL group (median 107 vs 143, p = 0.048) as well as in Binet A patients, albeit with borderline significance (median 139 vs not reached, p = 0.086). Conclusion: LPL expression was found to be closely correlated with IGHV gene mutational status and overall survival, proving LPL as prognostic marker in CLL. Our results also indicate a possible relationship between aberrant expression of LPL and BCR- and NOTCH1-dependent signalling pathways. Abbreviations used: BCR — B-cell receptor; CLL — chronic lymphocytic leukemia; FFA — free fatty acids; IGHV — immunoglobulin heavy variable; LPL — lipoprotein lipase; M — mutated; OS — overall survival; PCR — polymerase chain reaction; TFS — treatment-free survival; UM — unmutated; VH CDR3 — variable heavy complementarity-determining region 3. Chronic lymphocytic leukemia (CLL) is the most common type of leukemia in adults, characterized by a highly variable clinical course. While one third of patients present with a stable asymptomatic disease, which does not require any treatment and is characterized by nearly normal life expectancy, others invariably progress and ultimately develop chemorefractoriness . Such clinical heterogeneity is a reflection of biological heterogeneity. Several genetic and molecular features have been identified in CLL, which might affect significantly prognosis of the disease. These include the mutational status of the immunoglobulin heavy chain variable (IGHV) genes, certain recurrent genomic aberrations (deletions: 13q, 17p, 11q; trisomy 12), mutations in genes, which regulate apoptosis, DNA damage response or cell signalling (TP53, ATM, NOTCH1, SF3B1, BIRC3, MYD88, etc. ), the expression of certain stereotyped B-cell receptors (BCRs) [2–5]. Currently, IGHV mutational status, which is associated with antigen binding capacity and functions of the BCR, is considered as one of the most important prognostic biomarkers in CLL independent of clinical stage [2, 3]. 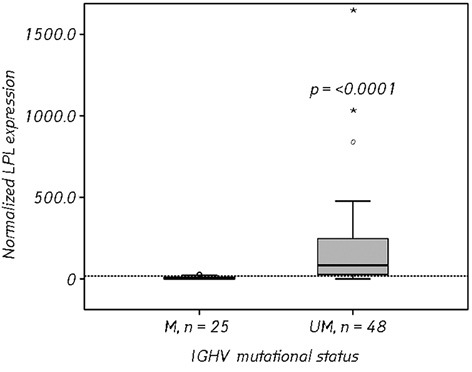 Patients carrying somatic hypermutations in their IGHV genes experience an indolent course compared to patients with unmutated (UM) IGHV genes and have better response to standard chemoimmunotherapy [6–8]. Gene expression profiling analysis of CLL revealed several genes correlating closely with the IGHV mutational status, including COBLL1, ZAP70, ADAM29, TCL1A, CLLU1, LPL [9–12]. Lipoprotein lipase (LPL) was identified as one of the most differentially expressed genes in IGHV UM vs IGHV mutated (M) CLL, with a significantly higher expression in the former group [9, 10]. High levels of LPL protein were detected also in the cytosol of CLL cells and on the cell surfaces [13, 14]. Additionally, several studies associated high LPL mRNA expression with short treatment-free (TFS) and decreased overall survival (OS) [13, 15–18]. LPL expression was also correlated with other prognostic markers: ZAP70, CD38, cytogenetic aberrations, and clinical stage [12, 13, 16, 19]. Thus, LPL is considered to be a reliable RNA-based marker for CLL prognosis. It is assumed, that it might also contribute to CLL cell survival and metabolism [20, 21]. LPL plays a central role in lipid metabolism and catalyzes the hydrolysis of very-low-density lipoproteins and chylomicrons, releasing free fatty acids (FFA). Additional noncatalytic binding functions lead to increased accumulation and cellular uptake of lipoproteins . LPL is normally expressed in adipocytes and muscle cells. Lower levels of this protein are produced by macrophages, hormone-secreting cells in the adrenals and ovaries, certain neuronal cells, spleen, testes, lung and kidney . LPL expression was not found in normal B-lymphocytes . Despite aberrant LPL expression in CLL has been reported long ago, molecular mechanisms driving this expression as well as exact function of LPL in CLL cells and its effect on progressive disease development are not fully understood. Recent data suggest that LPL might be involved in some key signalling pathways in CLL. It was de­monstrated in vitro that in CLL cells LPL expression is increased by BCR cross-linking . It was also shown, that LPL can be transcriptionally regulated by STAT3, a latent cytoplasmic transcription factor, which is constitutively serine-phosphorylated in CLL . Additionally, Kristensen et al. reported that LPL mRNA expression correlates closely with NOTCH1 gene mutations in CLL patients and, based on the role of NOTCH1 signalling in adipose tissue, interference between the NOTCH1 pathway and LPL expression was suggested. In our study we investigated LPL gene expression in relation to key immunogenetic and molecular mar­kers, including IGHV mutational status, BCR stereotypy, TP53, NOTCH1, and SF3B1 gene mutations. We also analysed the correlation of LPL expression status with clinical outcome. Patients and samples. The studied group consisted of 73 CLL patients (64 males and 9 females) referred to the State Institution “National Research Center for Radiation Medicine of the National Academy of Medical Sciences of Ukraine”. The study was approved by the local Ethics Review Committee. All patients gave the informed consent. The diagnosis of CLL was based on clinical history, lymphocyte morphology and immunophenotypic criteria. The clinical stage of CLL was determined based on the Binet  and Rai  staging systems. Treatment requirement was estimated according to National Cancer Institute criteria . The majority of patients (n = 64, 87.7%) were untreated at the time of blood collection and nine were treated with various therapeutic regimens using chlorambucil (5) and fludarabine (4). Previously treated patients were observed in relapse before the next course of therapy. At time of LPL expression analysis, mutational status of IGHV and NOTCH1 genes was evaluated in all 73 patients, TP53 — in 72, and SF3B1 — in 69 patients. Genomic DNA and total RNA were extracted from peripheral blood mononuclear cells (PBMCs) with the QIAamp Blood Mini Kit (Qiagen, Crawley, United Kingdom) and TRI Reagent® (Molecular Research Center Inc., Cincinnati, OH), respectively. The concentration and purity of RNA were assessed with NanoDrop Spectrophotometer (NanoDrop Technology). Purified RNA was stored in deep freeze until further use. Determination of IGHV mutational status and DNA sequence analysis. The IGHV gene mutational status was assessed by polymerase chain reaction (PCR) amplification followed by direct sequencing as reported previously . DNA sequence analysis and interpretation of IGHV/IGHD/IGHJ rearrangements were performed using the IMGT database (http://imgt.cines.fr, Montepellier, France) and the IMGT/V-QUEST tool [31, 32]. Clonotypic IGHV sequences with ≥ 98% homology to the closest germ-line gene were considered as UM, and cases with < 98% homology were considered as M [6, 7]. Assignment of cases to specific stereotyped subsets was performed following established guidelines and based on the following stringent criteria: the Ig sequences were connected if: 1) sharing at least 50% amino acid identity and 70% similarity within the variable heavy complementarity-determining region 3 (VH CDR3); 2) having identical VH CDR3 lengths and identical offsets of shared patterns between sequences; and 3) carrying IGHV genes of the same phylogenetic clan . Stereotyped subsets were defined and named according to published criteria [33–35]. TP53, NOTCH1 and SF3B1 mutation analysis. Mutation analysis was done by PCR amplification followed by direct sequencing. Screening for TP53 gene mutations was performed for exons 3 to 10 as described previously . NOTCH1 mutations and SF3B1 mutations were analyzed in the hotspot regions of these genes, where the vast majority of CLL-specific lesions were reported [37–39]. NOTCH1 gene mutations were analyzed in c.7282_7680 region in exon 34, and in the 3´UTR region (9:136,495553-136,495994), while SF3B1 gene mutations were studied in exons 14, 15 and 16, as described before [40, 41]. Quantitative real-time PCR (RT-qPCR). For gene expression analysis, cDNA was synthesized from 5 μg RNA using RevertAid First Strand cDNA Synthesis Kit (Thermo Scientific), according to the supplier’s instructions. RT-qPCR was performed with the Bio-Rad Real-time IQ Detector System (Bio-Rad) using the SYBR Green chemistry. Amplification was carried out with 2 μl of cDNA in a 25 μl reaction mixture containing 0.07 μМ of each primer and Absolute Blue qPCR SYBR Green Fluorescein Mix (Thermo Scientific). PCR cycling conditions were: an initial denaturation step of 95 °C for 15 min, then 45 cycles of 95 °C for 15 s, 60 °C for 30 s and 72 °C for 30 s. All reactions were done in duplicate. The expression levels of LPL were normalized to the expression of the housekeeping gene ABL1 (v-abl Abelson murine leukemia viral oncogene homolog 1). The following primers were used: for LPL — 5´-CAGCAGCAAAACCTTCATGGT-3´ and 5´-AGTTTTGGCACCCAACTCTCA-3´ (reported by Van Bockstaele et al. ); for ABL1 — 5´-TGGAGATAACACTCTAAGCATAACTAAAGGT-3´ and 5´-GATGTAGTTGCTTGGGACCCA-3´ (reported by Beillard et al. ). The relative LPL expression was determined using the comparative CT (2−ΔΔCt) method. Validation experiment was carried out preliminary following Van Bockstaele et al. , which confirmed the applicability of CT (2−ΔΔCt) method for evaluation of LPL expression. LPL expression in lymphocytes obtained from a healthy donor was used as a calibrator for relative quantification. Statistical analysis. Receiver operating characte­ristic (ROC) curve analysis was performed to determine the LPL expression cut-off values that best distinguished between IGHV M and UM cases. Association between LPL and IGHV mutational status was described using the Spearman correlation coefficient. Shapiro — Wilk’s test was applied to assess normal distribution. The Mann — Whitney U test was used to compare median levels of LPL between groups. Associations between LPL expression status and other categorical clinico-biological variables were assessed with the chi-square test or the Fisher exact test, where appropriate. Kaplan — Meier method was used to analyse OS and TFS. The log-rank statistic was used to determine significant associations between individual markers and OS or TFS. p values < 0.05 were considered statistically significant. All analyses were performed with the SPSS software package, version 13.0 (SPSS). Clinical and biological characteristics of CLL patients. The group of patients consisted of 64 men and 9 women, with a median age of 57 years (range: 39–76 years) at the time of diagnosis. Clinical and biological characteristics of patients are summarized in Table 1. Forty-eight patients (65.8%) had UM IGHV genes, whereas 25 (34.1%) patients had M IGHV. Seventeen patients (23.3%) were assigned to one of 12 previously reported BCR stereotyped subsets, based on VH CDR3 similarity [33–35]. Subset # 2 was the most frequently represented stereotyped variant (5 cases) in this CLL group followed by subset # 1 (2 cases). Other 10 identified subsets were represented by one case each (Table 2). Note: ND — not defined. *According to Baliakas et al. .
Mutations in NOTCH1 gene were the most frequent genetic abnormality in the present group, being detected in 11 of 73 (15.1%) of patients. They were mostly represented by a typical two base pair deletion c.7544_7545delCT (P2514fs*4) localized in exon 34 (10 (13.7%)) cases. In one case (1.4%) missense substitutions g.139390152 A>G in 3`UTR region of NOTCH1 gene was revealed. Mutations in TP53 gene were found in seven of 72 (9.7%) cases and were represented mainly by missense substitutions (5 cases, 71%). SF3B1 mutations were detected in eight of 69 (11.6%) cases and were represented by missense substitutions in all detected cases, which is consistent with previous reports [37, 38]. LPL expression and correlation with IGHV mutational status. Relative LPL expression levels in CLL samples ranged from 0 to 1663.5. UM IGHV cases showed a significantly higher LPL expression (median = 84.5, range 0.3–1663.5) in comparison with M ca­ses (median = 1.1, range 0–27.9), p < 0.0001 (Fig. 1). A strong correlation between individual LPL expression levels and IGHV mutational status was found (r = 0.684; p < 0.0001). We applied ROC curve analysis to calculate cut-off value for the LPL expression to distinguish IGHV M and UM cases. The cut-off value of 17 showed the best degree of discrimination. With this cut-off value 65 of 73 patients (89%) were classified correctly into the IGHV M and UM group, and this value was used for further analysis of associations of LPL expression with clinico-biological variables and clinical outcome. Prognostic value of LPL expression. Based on the cut-off value of 17, 44 (60.3%) CLL cases were classified as LPL-positive and 29 (39.7%) cases as LPL-negative. Follow-up information was available for all patients, 29 (39.7%) of whom died during the period of observation due to CLL-related causes. The estimated median OS was 106 months (95% CI 68.2–143.8 months). Log-rank tests for the Kaplan — Meier curves demonstrated significantly reduced OS for LPL-positive CLL patients in comparison with LPL-negative patients (107 vs 143 months), p = 0.048. Similar results were obtained, when the analysis was restricted to patients with stage A disease. The median OS in LPL-positive patients was 139 months, while the median OS was not reached in the LPL-negative group, although this difference did not reach statistical significance (p = 0.086) (Fig. 2). For the entire CLL group, significant association was also found between OS and Binet staging (p = 0.002), IGHV mutational status (p = 0.014), TP53 and SF3B1 mutations (p = 0.001) (Table 3). The median OS of the IGHV UM group was similar to that of the LPL-positive group (101 and 107 months respectively). For Binet A patients, IGHV mutation status and TP53 status remained significant predictors of OS (p = 0.041 and 0.038, respectively) (Table 4). Note: NR — not reached. *Stereotyped cases excluding # 16 and # 77 subsets, associated with indolent clinical course. Regarding TFS, although LPL-positive patients had shorter TFS in comparison with LPL-negative patients (medians 24 months vs 42 months), the difference was not statistically significant (p = 0.101). Meanwhile, significant difference in TFS was found for patients differing in IGHV mutation status (p = 0.002). LPL expression in relation to other prognostic markers. High LPL expression correlated with Binet stage, while no significant differences in the expression were found concerning patient gender, age at diagnosis and previous treatment. There was no correlation between LPL values and the pre­sence of TP53 or SF3B1 mutations. The vast majority of NOTCH1 mutated cases (9 of 11; 81.8%) demonstrated LPL-positive status, although the difference between groups did not reach significance, p = 0.113 (Table 5). LPL expression in relation to BCR stereotyped subsets. It was reported before, that LPL is differently expressed in some prognostically distinct stereotyped subsets [14, 43]. Twelve of 17 BCR stereotyped cases identified in our CLL group were assigned to seven major stereotyped subsets with defined clinical outcome , namely poor-prognostic subsets (# 1, # 2, # 3, # 5, # 7B), and favourable-prognostic subsets (# 16 and # 77) (Table 2). 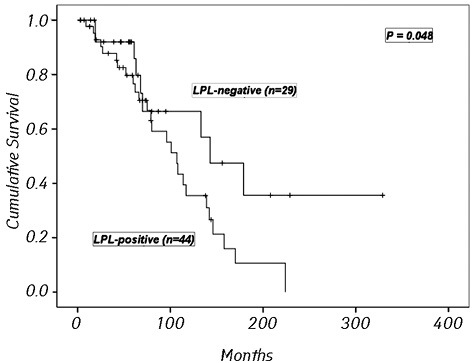 Comparison of these two groups regarding to LPL expression status showed correlation of LPL-positivity with poor prognostic subsets (p = 0.048), when subset # 2 cases were excluded. Stereotyped subset # 2 is characte­rized by restricted usage of IGHV3-21 gene, which is often M and a typical short VH CDR3 pattern . In our CLL group, all 5 subset # 2 cases were IGHV3-21/M and were classified as LPL-negative using cut-off value defined by ROC analysis. This is consistent with data by Mansouri et al. , where M/stereotyped IGHV3-21 cases showed low LPL mRNA expression and did not differ in this regard from other M CLL cases. In line with this, a strong correlation was found between LPL expression and IGHV mutational status in the entire group of patients with stereotyped BCR — all 10 stereotyped/UM cases were categorised as LPL-positive, while all 7 stereotyped/M cases — as LPL-negative (p = 0.0001). Thus, differential LPL expression in certain stereotyped subsets might simply reflect correlation between LPL expression and IGHV mutational status. Additionally, we compared the LPL expression levels between BCR stereotyped and unstereotyped cases in LPL-positive CLL group (all cases were IGHV UM). 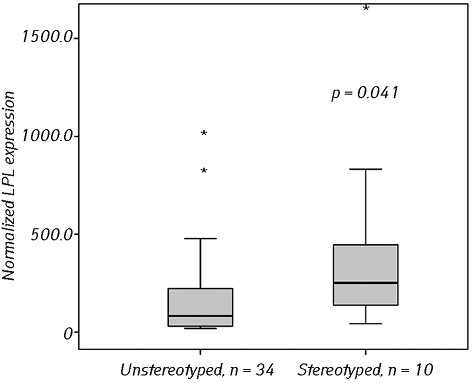 Stereotyped cases showed higher LPL mRNA expression in comparison to unstereotyped cases (median, 251 vs 82), the differences were statistically significant, p = 0.041 (Fig. 3). Nowadays, the IGHV mutational status is one of the most important prognostic biomarkers in CLL. Besides, it is also regarded as a powerful predictive mar­ker for estimation of response duration after standard therapy with FCR (fludarabine, cyclophosphamide and rituximab). CLL patients harbouring M IGHV genes, in particular, when combined with favorable cytogene­tics, were shown to have a high chance of achieving a durable remission after FCR [8, 45, 46]. IGHV mutational status assessment is recommended by the current guidelines in CLL patients requiring therapy . Along with that, the suggestion was made to include IGHV evaluation as standard clinical tests for all patients with newly diagnosed CLL since a greater understanding of the risk of disease progression at the time of diagnosis is of importance in the context of individual risk-adapted clinical management . Determination of the IGHV mutation status is quite laborious and not readily available in most routine diagnostic laboratories. This induced the search for surrogate markers with the same prognostic value as IGHV. Gene expression studies have suggested a number of possible alternatives with LPL expression being one of the better markers for distinguishing IGHV M and UM cases [12–16]. LPL was identified as one of the most differentially expressed genes between M and UM CLL cases in the initial gene expression profiling studies of Rosenwald et al. and Klein et al. . Considerable differences in the LPL expression were confirmed by other researches. In particular, Heintel et al. reported 34-fold higher, and Kaderi et al. — 73-fold higher median LPL expression in UM vs M CLL cases, making a clear distinction between the two groups of patients. Additionally, several studies showed that LPL mRNA expression is associated with short TFS and decreased OS in CLL [12, 13, 16–19, 26]. Our results, being in accordance with previous studies, proved IGHV mutation status as a reliable prognostic marker for OS (p = 0.014) as well as TFS (p = 0.002). It also remained significant predictor when only Binet A patients were considered (p = 0.041 and p = 0.037 for OS and TFS, respectively). It is of importance, since the majority of CLL patients nowadays are diagnosed at the early disease stages. We also revealed a strong correlation of LPL expression with IGHV mutational status in our CLL group. The discriminating cut-off value defined by ROC curve analysis allowed classification into the IGHV M or UM subgroups in 89% of patients. LPL expression showed a positive predictive value of 95% (42 of 44 LPL-positive cases were IGHV UM), and a negative predictive value of 79% (23 of 29 LPL-negative cases were IGHV M). This is comparable with previous reports on different CLL cohorts [13, 15, 16]. When analysed with regard to clinical outcome, LPL expression was associated with OS (p = 0.048), but the differences concerning TFS did not reach statistical significance (p = 0.101). Thus, our data in line with previous reports [12–19] suggest that LPL expression could be a useful surrogate marker for IGHV mutational status in CLL. The important advantage of LPL as a marker is that it might be measured in unselected peripheral blood mononuclear cells, since its expression in normal hematopoietic subsets are found at very low levels [13, 17]. Besides aberrant LPL gene expression, it was demonstrated that CLL cells are able to synthesize LPL protein and capture it on the cell surface . The functional role of LPL as well as its influence on progressive disease phenotype development, if any, are still not fully understood. It was suggested that LPL might play an important role in fatty acid metabolism and energy supply to B-CLL cells and could help the leukemic clone to increase survival and proliferative signalling, leading to disease progression [20, 21]. Molecular mechanisms, which drive aberrant expression of LPL gene in CLL are also still unknown. It is assumed that LPL expression might be influenced by BCR-dependent signaling pathways. Pallasch et al. demonstrated that in CLL cells LPL expression was increased by BCR cross-linking. Rozovski et al. showed that LPL expression can be trans­criptionally regulated by signal transduction and activator of transcription 3 (STAT3) phosphorylation, and nuclear translocation where it can bind LPL promoter. Later, it was demonstrated that in CLL cells, the STAT3 phosphorylation is induced under activation of BCR . Recently it was shown also that the BCR inhibitor ibrutinib reduced LPL mRNA and protein levels and inhibited FFA metabolism in CLL cells in vitro. Likewise, in CLL cells from ibrutinib-treated patients, FFA metabolism was reduced and eventually stopped . In our CLL cohort we observed higher LPL mRNA expression in BCR stereotyped compared to unstereotyped cases (p = 0.042). These also may be in favor of relationship between LPL expression and BCR-driven signaling, since stereotyped BCRs were shown to exhibit higher BCR reactivity [51, 52]. Other possible molecular mechanisms regulating LPL expression in CLL are also reported. Kristensen et al. recently showed that LPL mRNA expression correlates closely with NOTCH1 gene mutations in CLL patients and, based on the role of NOTCH1 signalling in adipose tissue, interference between the NOTCH1-dependent pathway and LPL expression was suggested. In line with this we found, that most of NOTCH1 mutated cases in observed CLL group were LPL-positive (9 of 11 cases, 81.8%), although the diffe­rences did not reach statistical significance (p = 0.113). In summary, the results of our study show close correlation of LPL expression with IGHV gene mutational status and OS, proving LPL as a reliable RNA-based prognostic marker in CLL. Relationships between LPL aberrant expression and BCR- and NOTCH1-dependent signalling pathways in CLL needs to be studied further. Montillo M, Hamblin T, Hallek M, et al. Chronic lymphocytic leukemia: novel prognostic factors and their relevance for risk-adapted therapeutic strategies. Haematologica 2005; 90: 391–9. Rossi D, Gaidano G. The clinical implications of gene mutations in chronic lymphocytic leukaemia. Br J Cancer 2016; 114: 849–54. Kipps TJ, Stevenson FK, Wu CJ, et al. Chronic lymphocytic leukaemia. Nat Rev Dis Primers 2017; 3: 1–53. Lazarian G, Guièze R, Wu CJ. Clinical implications of novel genomic discoveries in chronic lymphocytic leukemia. J Clin Oncol 2017; 35: 984–93. Baliakas P, Mattsson M, Hadzidimitriou A, et al. No improvement in long-term survival over time for chronic lymphocytic leukemia patients in stereotyped subsets #1 and #2 treated with chemo(immuno)therapy. Haematologica 2018; 103: 158–61. Rossi D, Terzi-di-Bergamo L, De Paoli L, et al. Molecular prediction of durable remission after first line fludarabine-cyclophosphamide-rituximab in chronic lymphocytic leukemia. Blood 2015; 126: 1921–4. Vasconcelos Y, De Vos J, Vallat L, et al. Gene expression profiling of chronic lymphocytic leukemia can discriminate cases with stable disease and mutated Ig genes from those with progressive disease and unmutated Ig genes. Leukemia 2005; 19: 2002–5. Kaderi MA, Kanduri M, Buhl AM, et al. LPL is the strongest prognostic factor in a comparative analysis of RNA-based markers in early chronic lymphocytic leukemia. Haematologica 2011; 96: 1153–60. Heintel D, Kienle D, Shehata M, et al. High expression of lipoprotein lipase in poor risk B-cell chronic lymphocytic leukemia. Leukemia 2005; 19: 1216–23. Mansouri M, Sevov M, Fahlgren E, et al. Lipoprotein lipase is differentially expressed in prognostic subsets of chronic lymphocytic leukemia but displays invariably low catalytical activity. Leuk Res 2010; 34: 301–6. Oppezzo P, Vasconcelos Y, Settegrana C, et al. The LPL/ADAM29 expression ratio is a novel prognosis indicator in chronic lymphocytic leukemia. Blood 2005; 106: 650–7. Van Bockstaele F, Pede V, Janssens A, et al. Lipoprotein lipase mRNA expression in whole blood is a prognostic marker in B cell chronic lymphocytic leukemia. Clin Chem 2007; 53: 204–12. van’t Veer MB, Brooijmans AM, Langerak AW, et al. The predictive value of lipoprotein lipase for survival in chronic lymphocytic leukemia. Haematologica 2006; 91: 56–63. Stamatopoulos B, Meuleman N, De Bruyn C, et al. A molecular score by quantitative PCR as a new prognostic tool at diagnosis for chronic lymphocytic leukemia patients. PLoS One 2010; 5: e12780. Mátrai Z, Andrikovics H, Szilvási A, et al. 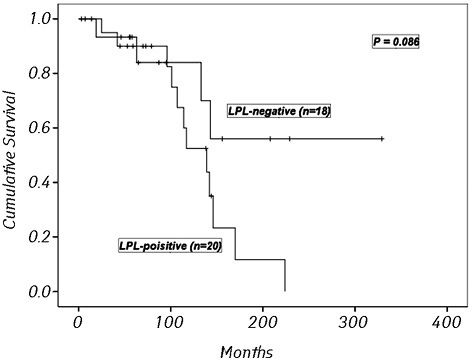 Lipoprotein lipase as a prognostic marker in chronic lymphocytic leukemia. Pathol Oncol Res 2017; 23: 165–71. Rombout A, Verhasselt B, Philippé J. Lipoprotein lipase in chronic lymphocytic leukemia: function and prognostic implications. Eur J Haematol 2016; 97: 409–15. Prieto D, Oppezzo P. Lipoprotein lipase expression in chronic lymphocytic leukemia: new insights into leukemic progression. Molecules 2017; 22: e2083. Mead JR, Irvine SA, Ramji DP. Lipoprotein lipase: structure, function, regulation, and role in disease. J Mol Med 2002; 80: 753–69. Wang H, Eckel RH. Lipoprotein lipase: from gene to obesity. Am J Physiol Endocrinol Metab 2009; 297: 271–88. Pallasch CP, Schwamb J, Konigs S, et al. Targeting lipid metabolism by the lipoprotein lipase inhibitor orlistat results in apoptosis of B-cell chronic lymphocytic leukemia cells. Leukemia 2008; 22: 585–92. Rozovski U, Grgurevic S, Bueso-Ramos C, et al. Aberrant LPL expression, driven by STAT3, mediates free fatty acid metabolism in CLL cells. Mol Cancer Res 2015; 13: 944–53. Kristensen L, Kristensen T, Abildgaard N, et al. LPL gene expression is associated with poor prognosis in CLL and closely related to NOTCH1 mutations. Eur J Haematol 2016; 97: 175–82. Binet JL, Auquier A, Dighiero G, et al. A new prognostic classification of chronic lymphocytic leukemia derived from a multivariate survival analysis. Cancer 1981; 48: 198–206. Rai KR, Sawitsky A, Cronkite EP, et al. Clinical staging of chronic lymphocytic leukemia. Blood 1975; 46: 219–34. Cheson BD, Bennett JM, Grever M, et al. National Cancer Institute-sponsored Working Group guidelines for chronic lymphocytic leukemia: revised guidelines for diagnosis and treatment. Blood 1996; 87: 4990–7. Abramenko I, Bilous N, Chumak A, et al. Chronic lymphocytic leukemia patients exposed to ionizing radiation due to the Chernobyl NPP accident — with focus on immunoglobulin heavy chain gene analysis. Leuk Res 2008; 32: 535–45. Lefranc MP, Giudicelli V, Ginestoux C, et al. IMGT, the international ImMunoGeneTics information system. Nucleic Acids Research 2009; 37: 1006–12. Brochet X, Lefranc MP, Giudicelli V. IMGT/V-QUEST: the highly customized and integrated system for IG and TR standardized V-J and V-D-J sequence analysis. Nucleic Acids Res 2008; 36: 503–8. Agathangelidis A, Darzentas N, Hadzidimitriou A, et al. Stereotyped B-cell receptors in one third of chronic lymphocytic leukemia: A molecular classification with implications for targeted therapies. Blood 2012; 119: 4467–75. Jeromin S, Weissmann S, Haferlach C, et al. SF3B1 mutations correlated to cytogenetics and mutations in NOTCH1, FBXW7, MYD88, XPO1 and TP53 in 1160 untreated CLL patients. Leukemia 2014; 28: 108–17. Puente XS, Beà S, Valdés-Mas R, et al. Non-coding recurrent mutations in chronic lymphocytic leukemia. Nature 2015; 526: 519–24. Abramenko IV, Bilous NI, Chumak AA, et al. Analysis of the 3’UTR region of the NOTCH1 gene in chronic lymphocytic leukemia patients. Exp Oncol 2018; 40: 211–7. Beillard E, Pallisgaard N, van der Velden VH, et al. Evaluation of candidate control genes for diagnosis and residual disease detection in leukemic patients using ‘real-time’ quantitative reverse-transcriptase polymerase chain reaction (RQ-PCR) — a Europe against cancer program. Leukemia 2003; 17: 2474–86. Mansouri L, Gunnarsson R, Sutton LA, et al. Next generation RNA-sequencing in prognostic subsets of chronic lymphocytic leukemia. Am J Hematol 2012; 87: 737–40. Baliakas P, Hadzidimitriou A, Sutton LA, et al. Clinical effect of stereotyped B-cell receptor immunoglobulins in chronic lymphocytic leukaemia: a retrospective multicentre study. Lancet Haematol 2014; 1: 74–84. Fischer K, Bahlo J, Fink AM, et al. Long-term remissions after FCR chemoimmunotherapy in previously untreated patients with CLL: updated results of the CLL8 trial. Blood 2016; 127: 208–15. Thompson PA, Tam CS, O’Brien SM, et al. Fludarabine, cyclophosphamide, and rituximab treatment achieves long-term disease-free survival in IGHV-mutated chronic lymphocytic leukemia. Blood 2016; 127: 303–9. Hallek M, Cheson BD, Catovsky D, et al. iwCLL guidelines for diagnosis, indications for treatment, response assessment, and supportive management of CLL. Blood 2018; 131: 2745–60. Parikh SA, Strati P, Tsang M, et al. Should IGHV status and FISH testing be performed in all CLL patients at diagnosis? A systematic review and meta-analysis. Blood 2016; 127: 1752–60. Rozovski U, Harris DM, Li P, et al. Activation of the B-cell receptor successively activates NF-κB and STAT3 in chronic lymphocytic leukemia cells. Int J Cancer 2017; 141: 2076–81. Rozovski U, Harris DM, Li P, et al. Ibrutinib inhibits free fatty acid metabolism in chronic lymphocytic leukemia. Leuk Lymphoma 2018; 21: 1–6. Del Giudice I, Chiaretti S, Santangelo S, et al. Stereotyped subset #1 chronic lymphocytic leukemia: a direct link between B-cell receptor structure, function, and patients’ prognosis. Am J Hematol 2014; 89: 74–82. Gounari M, Ntoufa S, Apollonio B, et al. Excessive antigen reactivity may underlie the clinical aggressiveness of chronic lymphocytic leukemia stereotyped subset #8. Blood 2015; 125: 3580–7.